The App: A multitouch skateboarding game that uses your fingers as legs. It's like a Tony Hawk game, but you're looking straight down at the board and kickflipping with your index finger. It's got tutorial videos, jam sessions and competitions, and there are a slew of bonus boards for you to unlock as you rack up the points. The Verdict: Touchgrind is pretty great, but it's not without its annoying quirks. 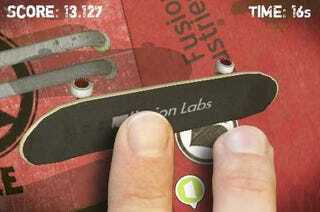 The basic premise, that your fingers act as feet on a skateboard, is beautifully executed. It takes a few minutes to get used to controlling the board (I actually prefer using my thumbs to the two finger method they suggest), but it's incredibly responsive and the graphics and sound effects are top notch. Performing tricks becomes pretty intuitive after a little while, and just fooling around in the park when you've got a few minutes to kill is great. The problem is that the skateboard takes up most of the screen. You're in a skate park full of jumps and tabletops and rails, but you can't see them until you hit them. You can zoom out to see the whole map, but you can't control the board when you're zoomed out, as the board is too small for your fat fingers to control. There are also symbols that point towards the different elements of the park, and they flash when you're supposed to execute your jump, but the timing feels off. Also, you often run right into the side of a jump, as the icons don't differentiate what direction you're supposed to come from.